Below are a few of the tower clocks that I have restored. Some are better documented than others but all have before and after photos. Restoration times can be exaggerated if I took a hiatus during the restoration. In later projects I broke down the number of sessions, as well as the total time spent. I tend to spend more time on written and photographic documentation than would be necessary on most projects and so 10% should be deducted for this activity. I certainly would not be considered an 'efficient' restorer! COLLIN - WAGNER successor company to BERNARD-HENRI WAGNER, PARIS, FRANCE c. 1880 -1890s. 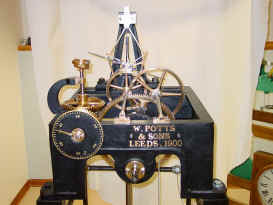 Two train, pinwheel escapement, count-wheel, half and hour, strike. Has a 30 second Bernard-Henri Wagner gravity remontoire. 34"w x 24"h x 14"d.
I did not keep a log of hours spent but the project was done in 1998. This was my first restoration - imagine having a Wagner with a remontoire for the first restoration! I did not have a parts count or number of hours spent. Project: 03/99 - 05/00. Total time 400 hours. Parts count 444, or 54 minutes/part, or 49 minutes without documentation. This clock was a real basket case when I got it. I promised myself never to take on a clock in such a deteriorated condition again. Two train, Graham deadbeat escapement, rack & snail hour and half hour strike. 22"h x 18"w x 12"d.
Project: 12/01 - 07/02. Total time 185 hours. Parts count 393, or 47 minutes/part, or 42 minutes without documentation. Project: 07/00 - 10/00. Total time 130 hours. Parts count 178, or 44 minutes/part or 39 minutes without documentation. Three train, Graham deadbeat escapement, rack & snail, quarter strike. 45.75"w x 30"h x 24"d.
Project: 01/03 - 02/04 (there was a 5 month hiatus). Total time 325 hours. Parts count 405, or 48 minutes/part or 43 minutes without documentation. I broke the promise I made to myself after the Odobey, this too was in very rough condition. 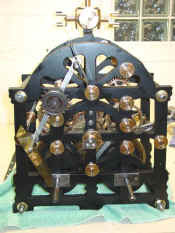 Two train, Graham deadbeat escapement, count-wheel, half and hour strike. 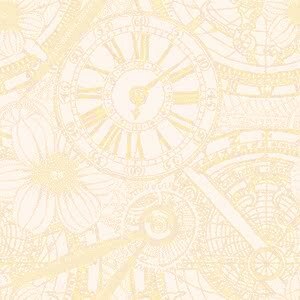 Has 60 second Robin style endless chain remontoire. 30 hour duration. 17.5"w x 18"h x 18"d.
Project: 03/04 - 06/04. Total time 117 hours. Parts count 247, or 28 minutes/part or 26 minutes without documentation. The efficiency in time/part is reflected in condition, advancing technique, but mostly in the fact that the clock is small. Less surface area for cleaning and polishing results in less time spent. Three train, Graham deadbeat escapement, count-wheel, quarter strike. Has 60 second differential style gravity remontoire. 30 hour duration. 38"w x 55"h x 30"d.
Project: 02/05 - 05/06. Total time 276 hours. Parts count 579, or 29 minutes/part or 26 minutes without documentation. There were 151 sessions averaging 1.83 hours/session. I'm getting a bit more efficient. This is the most complex tower clock I've worked on in terms of parts and construction. Maker, Unknown. Most likely a 'one off' exhibition or "engineer's" piece of English origin, c. late 1800's. 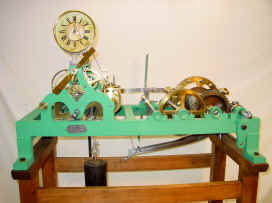 Three train, four legged gravity escapement, count-wheel quarter /rack & snail hour strike. 27"w x 30"h x 11.25"d.
This movement was not restored by me. I was done by the same firm that is currently making a commission clock to my design. It's instructive to compare my meager efforts to that of a true, gifted professional. 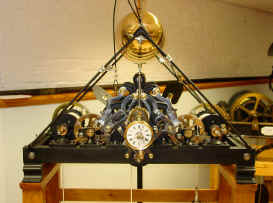 Single train, Graham dead beat escapement, equipped with 30 second differential style remontoire. 12"w x 20"h x 11"d.
Project: 07/07 - 4/08. Total time 88 hours. Parts count 120, or 44 minutes/part or 39 minutes without documentation. There were 43 sessions averaging 2.04 hours/session.